Take the dough out of the mixer and knead on lightly floured surface for 1 minutes. Roll dough 1.2 cm thickness, cut with 6 cm cookie cutter. Brush with egg white and water, sprinkle chopped dill and cumin seeds. Lay on parchment paper and bake in oven on 180°C for 10-12 minutes. Bring hot water and Knorr Demi Glace together and whisk over medium heat, simmer until thick for up to 10 minutes. Serve on the side. Place pulled beef, water, and Knorr Jus powder on medium heat, add Knorr BBQ Sauce and Worcestershire sauce, season with salt and pepper and bring to a simmer until incorporated and thick. Keep warm. 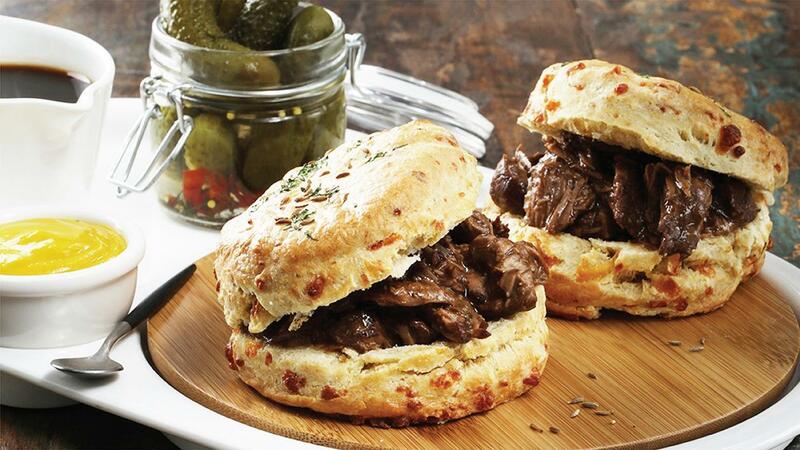 Open warm scones in half, and start by adding Best Foods Real Mayonnaise, top with pulled beef mix, add pickles and finish with mustard, serve with jus sauce on the side.